The Broulee Canberra Capitals, giving their all in the 2018 George Bass Surfboat Marathon. Photo: Andrew Green, George Bass Media Team. When it comes to the toughest and longest surfboat challenge in the world, women take centre stage. 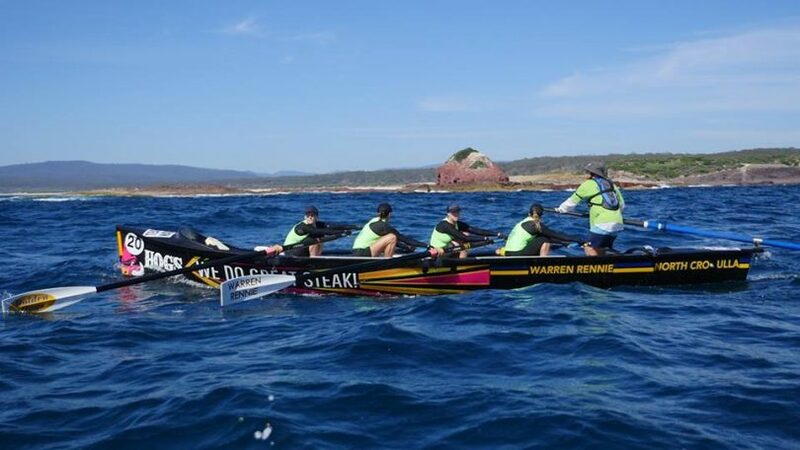 Of the 25 surfboats competing last week in the George Bass Surfboat Marathon, nine were powered by women – including one from Canberra. And among the remaining 16, a number of the male crews had one or two lady rowers helping make up their team of eight. 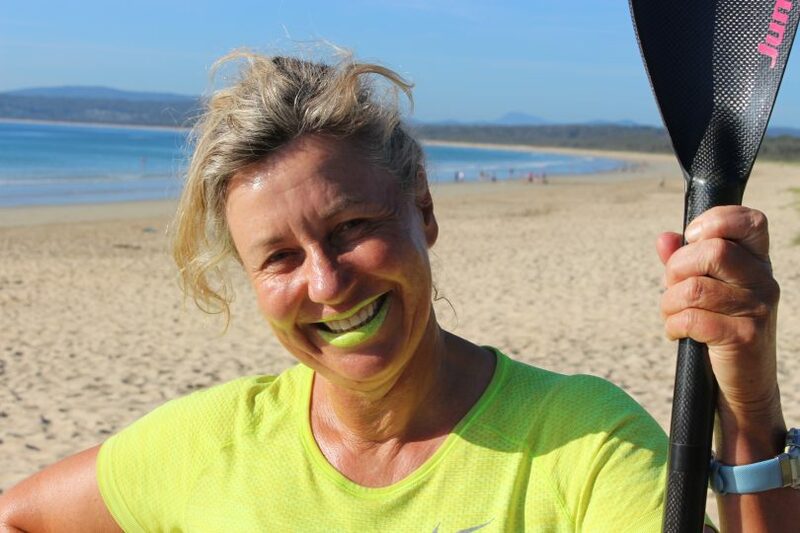 Just one woman competed in the ski paddle race, Pambula mum Jacqui Keough. This 190km journey started under the bridge at Batemans Bay on New Year’s Eve and concluded on Saturday at the town wharf in Eden. It only happens every two years for good reason. One man died and was brought back to life on the finish line in Moruya on day one, while on day four of the great race three members of the Broulee Bats Masters Women had to be treated for hypothermia after four hours at sea punching into a two metre swell and a 26km/hr cold southerly wind, all while completing the 24km leg from Narooma to Bermagui. The number of sodden split feet, blistered and bleeding hands, and backsides as purple as an angry sky all increased over the seven days of the event. One crew even battled on with a bout of gastro! Women first started competing in the Bass in 1997, part of a resurgence in the race which dates back to 1975. The 2018 Bass is the first where the women’s crews, like the men’s, haven’t taken a rest day. This year, the Open Women from North Cronulla Surf Life Saving Club and the Masters Women from Pambula really created waves, winning each of the seven legs in their division. Other female crews included Avalon Beach, Darwin, Torquay, Moruya, and Broulee. Avalon Beach completed the race on old-school static seats rather than modern sliding racing seats. With eight-time Bass veteran Gary Pettigrove as Sweep, the ladies from Canberra pushed the other three crews in the Open Women hard, the Capitals finishing in fourth place overall. “This is my fourth Bass, it’s a great way to start the year,” Vikki Fischer from the Capitals says. “It’s a good cleanser, you work hard for about six months, and in Canberra, it’s bloody minus eight in the middle of winter when we are training [on Lake Burley Griffin]. “You get a group of girls together that is going to slog it out, it means a hell of a lot in terms of being in a team,” Vikki smiles. The North Cronulla Open Women, so strong in the push south to Eden, winning 7 from 7. Photo: Les Herstik, George Bass Media Team. Many if not most of the women competing are mums, which seems to give them added grit and determination, an unconscious statement about motherhood and what women can do. Stephanie Roberts from the dominant North Cronulla Open Womens crew has been rowing for 12 years, but this was her first Bass. “You want to set a good example for your kids, and there have been so many strong mothers around me that have done it, so I knew that I could do it,” Stephenie says. “I had two brothers rowing this time, I had a sister-in-law rowing, my father-in-law and brother-in-law were on the support boat, and I had a potential sister-in-law rowing as well. “This is family, this is community, it was one of the things I had to tick off my list,” she says. In most cases, these mums (and supporting dads) brought their kids on the road with them, juggling the fierce competition at sea with family life in the massive pop-up George Bass campgrounds at Moruya, Bermagui, and Tathra. Pambula’s Jacqui Keough – “My kids just think that it’s normal and part of life.” Photo: Ian Campbell. The only female competitor in a field of 14 ski paddlers got a big cheer at the beach every day. Pambula’s Jacqui Keough says her shoulders are stiff and she is really tired but is rapt with her achievement. “I am not an elite athlete, I do this for fitness and fun,” Jacqui says. As a 53-year-old mum of two teenagers, Jacqui is very aware of the example she is setting. “When I left home, my mum was not even forty, and she thought she was old, she really did,” Jacqui remembers. Jacqui thanks the comradery of the surf club culture for making her participation possible. “It makes a difference to your well being and adds to your family, these people are role models to my kids,” she says. The Darwin “Croc Biscuits” first had to drive 4,200km to take part in the Bass. Photo: Andrew Green, George Bass Media Team. The commitment of the “Croc Biscuits” from Darwin perhaps rivals that of the Capitals and their frozen mornings’ training on Lake Burley Griffin. 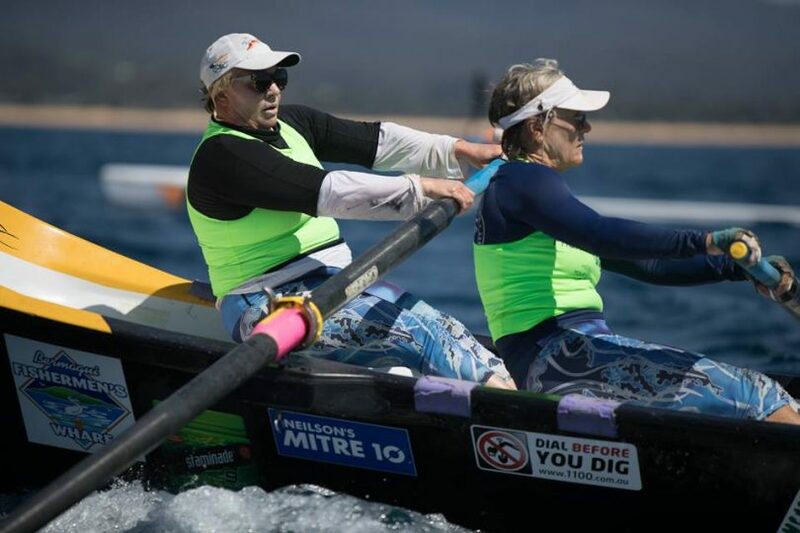 Seven of the Masters’ Women from Darwin drove 4,200km to take part, picking up a borrowed boat from Bermagui Surf Club when they arrived. “This is something we have been talking about for a long time, and it just came together this year, so we said – let’s do it!” Darwin rower, Heather Stanley says. The age range of the Darwin crew is 44 to 62 years. Some of those competing saw hail for the first time while camped at Bermagui as a southerly buster moved up the coast. Darwin’s Jo Gardiner says the rhythm of the boat is important. “You can hear the clicking of the oars and if they are in time, that’s a good feeling,” she told the ABC. “You really want to push yourself. You can’t be a weak link in the team, nobody wants to be that weak link so you really drive yourself,” Jo says. Darwin finished fourth in the overall Masters Women point score, promising to return in 2020 having learnt a few lessons. 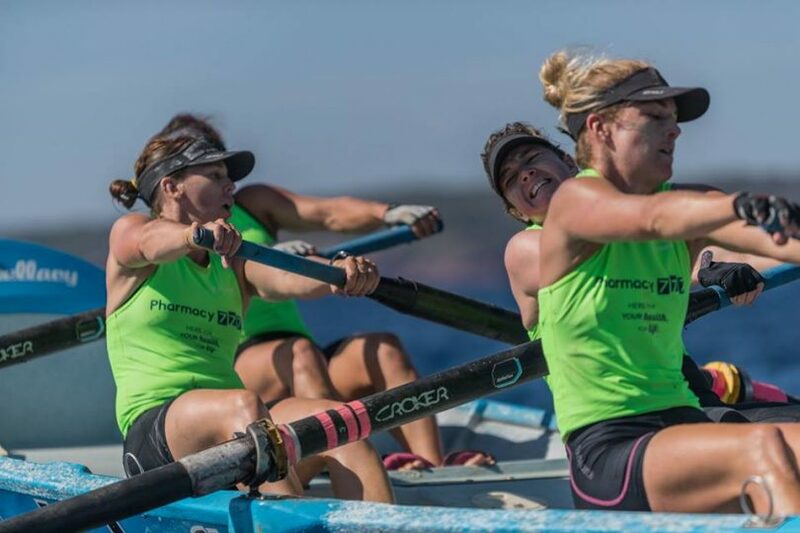 While the men’s crews are always going to be faster, stronger, and impressive in their own right, what the women do without favour or fanfare adds extra depth and character to this mighty event know as the George Bass Surfboat Marathon. Ian Campbell travelled as a guest of the George Bass Surfboat Marathon. *Video content created and supplied by Dr Matthew Nott.